The Hallmark Channel will be making some schedule changes that start next week. Beginning Tuesday. February 19, 2013, Frasier will get an additional block, airing Tues-Thurs from 8-10pm, replacing Happy Days. Hallmark airs NUMB3RS on Mondays in that block and movies on Fridays. Happy Days will remain airing weekdays 2-5pm but is not off of primetime beginning next week. And Frasier will remain airing 10pm-12am & 3-5am weeknights as well. Then starting the following week, Hallmark Channel will once again shuffle the timings for their original daytime block. Beginning Monday, February 25, 2013, Home & Family movies from 10am-12pm to 8am-10am, replacing a Golden Girls block. Then Marie moves from 12pm to 10am, while Mad Hungry with Lucinda Scala Quinn moves from 1pm to 11am. If you're taking notes at home, that means the original daytime block is now going to be weekdays 8am-12pm rather than 10am-2pm. The Golden Girls will now take over the weekdays 12-2pm block leading int Happy Days. In terms of stunts, Hallmark will have a Frasier marathon on Saturday, March 9, 2013. The marathon will be a 24-hour event beginning at 6am. The good doctor is in! 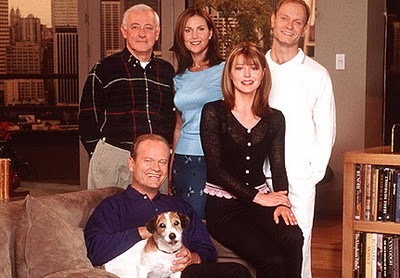 Frasier stars Kelsey Grammer, David Hyde Pierce, John Mahoney, Jane Leeves, Peri Gilpin, and Moose the dog. Stay with us for continued updates on Hallmark Channel! For the week of February 18-22, 2013, we have many current sitcom stars and past sitcom stars on TV talk shows! All times listed are Eastern. So get your DVR's (or whatever you use) ready! Ready? Here is all what you need to know for the coming week! Alison Brie (Community) - Alison appears on Late Night with Jimmy Fallon at 12:37am on NBC. Jon Cryer (Two and a Half Men) - Jon visits LIVE! with Kelly and Michael, so check your listings. Chelsea Handler (Are You There, Chelsea?) - Chelsea is a guest on The Ellen DeGeneres Show, so check listings. Jenny McCarthy (Two and a Half Men/Jenny) - Jenny stops by The Talk on CBS at 2pm ET/1pm CT-PT. Drew Carey (The Drew Carey Show) - The Price Is Right host brings classic games all this week to The Talk on CBS at 2pm ET/1pm CT-PT. Patrick Warburton (Rules of Engagement/Seinfeld) - Patrick talks about his involvement with St. Jude Children's Research Hospital and his voice work on the five-time Emmy® winning comedy, Family Guy, on Marie at 12pm on Hallmark Channel. John Stamos (Full House) - John stops by The Jeff Probst Show, so check your local listings. Jon Cryer (Two and a Half Men) - Catch Jon on The Late Late Show with Craig Ferguson at 12:37am on CBS. David Spade (Rules of Engagement/8 Simple Rules/Just Shoot Me) - David continues to make the rounds on Late Night with Jimmy Fallon at 12:37am on NBC. Alison Brie (Community) - Alison appears on Comedy Central's The Daily Show with Jon Stewart at 11pm. Josh Hopkins (Cougar Town) - Josh visits Conan at 11pm on TBS. Jennifer Finnigan (Better with You) - Jennifer is a guest on Anderson Live, so check your local listings. Michael Strahan (Brothers) - Watch Michael on Jimmy Kimmel Live! at 11:35pm on ABC. Chelsea Handler (Are You There, Chelsea?) - Chelsea visits The Tonight Show with Jay Leno at 11:35pm on NBC. Lisa Kudrow (Friends/The Comeback) - Lisa appears on The Late Late Show with Craig Ferguson at 12:37am on CBS. Joel McHale (Community) - Joel drops by Last Call with Carson Daly at 1:35am on NBC. Ken Marino (Party Down) - Ken is a guest on Conan at 11pm on TBS. Johnny Galecki (The Big Bang Theory/Roseanne) - Johnny stops by LIVE! with Kelly and Michael, so check your listings. Wanda Sykes (The New Adventures of Old Christine/Wanda at Large) - Wanda chats on The Ellen DeGeneres Show, so check listings. Melissa Rauch (The Big Bang Theory) - Tune in to see Melissa on Anderson Live, so check your local listings. Yvette Nicole Brown (Community) - Yvette guest co-hosts Anderson Live, so check your local listings. Arsenio Hall (Arsenio) - Arsenio appears on The Tonight Show with Jay Leno at 11:35pm on NBC. Molly Shannon (Kath & Kim) - Molly visits The Late Late Show with Craig Ferguson at 12:37am on CBS. Anthony Anderson (Guys with Kids/All About the Andersons) - Anthony is a guest on Late Night with Jimmy Fallon at 12:37am on NBC. Mila Kunis (That '70s Show) - Tune in to see Mila on Conan at 11pm on TBS. Zach Braff (Scrubs) - Zach drops by LIVE! with Kelly and Michael, so check your listings. Jenna Elfman (1600 Penn/Courting Alex/Dharma & Greg) - Jenna chats on The Talk on CBS at 2pm ET/1pm CT-PT. Shirley Jones (The Partridge Family) - Shirley sits down to talk about her amazing career, famous family and her upcoming memoir on Marie at 12pm on Hallmark Channel. William Shatner ($#*! My Dad Says) - Watch William on The Late Late Show with Craig Ferguson at 12:37am on CBS.